Believe me when I tell you, the last thing I wanted to do was sing when I walked through the lobby of that hospital. I was tired, hungry, and sad. I am not proud to tell you this, but I didn’t want to praise God in that moment. I didn’t want to count my blessings. I just wanted a sandwich. But then a song rose up around me, when I wasn’t even ready for it, when I didn’t even want it. A song found me in the last place I thought to look — the lobby at Mayo Clinic. There we all were — a bunch of patients and moms and grandpas and nurses and therapists — all shuffling from place to place. A lot of us were lugging our heartache and our worry and IV poles — chins sort of pinned to our chests, eyes to the ground. But then, up rose a song. When none of us could sing, someone brought us a song. We all stopped in our tracks. All the doctors and the sad mamas and the cancer patients — and the daughters like me whose Dad was having part of his leg amputated. We all stopped, on account of a song. That day, I dropped to my knees on the lobby of the floor and let the tears flow. The man by the piano said we should all sing along, so that’s what we did. We just stopped and sang. Some of us cried through the words, “This Little Light of Mine.” It was all music — the notes and the tears. I thought about that moment today, as we begin to prepare for Thanksgiving. I thought about it because this has been a really hard year for our family. Dad lost part of his leg, and is still struggling to heal. Our youngest daughter Anna was in and out of hospitals for months, while specialists worked to figure out why she was so sick. And of course, the backdrop to our personal struggle is a world gripped by division, an election that has ripped us all apart. So many people are groping around in the dark trying to find patches of light. The days when I don’t feel like singing at all, are the days when I need to sing most of all. I know I’m not alone. Because I’ve read the emails you’ve sent me. I’ve prayed over the requests you’ve delivered on Facebook. I know that many of you don’t feel like singing at all this Thanksgiving. Being grateful feels hard because of what you’re going through. Friend, maybe this is when we need to sing the most. Maybe this is when we need to be loudest in our praise. We can’t wait for perfect conditions to be grateful. Gratitude is more than a nice gesture acknowledging the gifts in our lives. It is the stubborn refusal to be held hostage by fear and despair. It’s saying to the world — and to ourselves — that despite everything, this old world is still a beautiful place. No matter how hopeless it all seems, there’s always, always something to be thankful for. 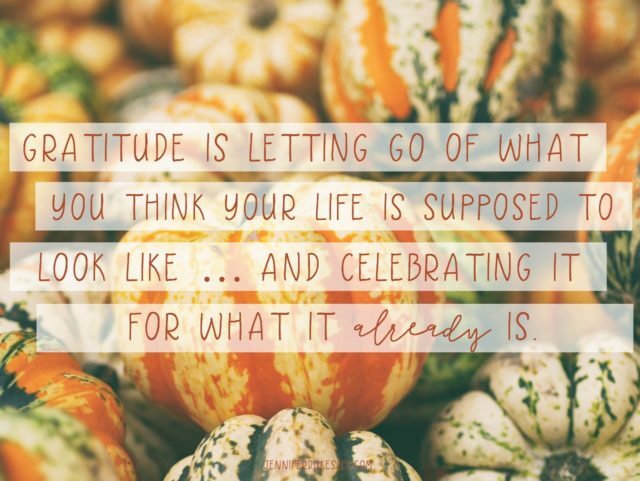 This year, I’ve come to believe that gratitude is letting go of what you think your life is supposed to look like … and celebrating it for what it already is. And I’m inviting you to join me. Let’s be intentional in our gratitude. Let’s offer a chorus of praise even on our hardest days — especially on our hardest days. I’ve put together a Happiness Dare for us. For the next 30 days, we can count our blessings together. Whatever day you’re joining us, simply start with day 1, and complete one a day, for the next 30 days. Share your blessings with us in community on Facebook, on Instagram, or Twitter. Use the tag #TheHappinessDare. Your gratitude might just change your world, but first, let it change you. When we look for things that make us grateful, we start seeing them. And when we start noticing them, we are making actual investments in the thoughts of our future selves. We are building neural pathways, all the while becoming more resourced on the inside. When we are more resourced with happiness, we have a kind of happiness bank that we can draw from on our hardest days. We can begin accumulating resources in our happiness banks by taking five minutes every day to consider our blessings. It’s a good practice to write them down, but you don’t have to. Merely thinking of your blessings has a profound effect on your outlook. We can devote five minutes a day, dwelling on the good things and thanking the one who gave them to us. I understand that you may not be one of those unstoppably positive people whom you know—the kind of person who wakes up singing songs, the kind of person who relentlessly posts cuddly puppy pictures on Facebook. I understand how you might be inclined to forgo counting your blessings on your hardest days. And I totally get how it feels selfish to make a list of what’s right in your little world when you know there’s a girl in a developing country who can see the ribs under her skin. Thank God anyway. We must. There are so many good gifts here in this world. Clean sheets and Frisbee golf and kites and reruns of Friends. A cool breeze through a cracked window. A Charlie Brown Christmas on a cold December night. An overdue date with your husband, and his arm over your shoulder at the movies. A new bottle of bubble bath, a fresh haircut, leggings-and-boots weather, the smell of a bookstore, a long rope of licorice. Thank God for what you have been given and then use your gratefulness as a way to share the gospel with a world in need of a reason to praise. ~ From The Happiness Dare. 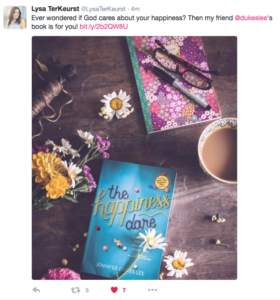 read chapter 14 of The Happiness Dare. Our featured writer this week is Nicki Schroeder. Her words arrive at the perfect time with a post titled ‘Gratitude When You’ve Got A Bad Attitude.’ If this week has you stressed, bookmark her post and come back to it before you sit down for a Thanksgiving meal! Find Nicki here. Jennifer I loved reading this the first time, and all the memories came flooding back about your courageous dad, and how greatly the music at Mayo ministered. I shall never forget how it gave you hope, and how your dad, himself, gave others hope, despite his own challenges and suffering. He is one amazing guy. this also spoke so deeply to me, b/c I had a similar experience when I was a patient at Mayo twice… once, hearing the music, and the second time, joining in myself. I recorded it all in my journal as a tangible reminder of hope in the midst of uncertainty. I soloed and also sang duets w/ an alto. A wonderful guy (w/ whom I still maintain contact) accompanied on the grand piano. We performed a long while, so enraptured in the music, so lifted up, that we failed to see (till someone pointed up to the balcony) the audience that was assembled. They looked to me like the heavenly believers, the crowd of witnesses, cheering us on. It was amazing. (that, or a choir of angels, b/c later they joined in ). I thank you for your encouragement, in this divisive time, to come together to count blessings, of whom I consider one of my foremost. You are so precious to me, and your girls. I’m going to keep counting, and when we gather around our TG feast (where we are requesting that politics be off limits), I am going to imagine them as my Mayo menagerie, and ask that we stay in that circle, join hands and sing, “We gather together to ask the Lord’s blessing.” and I know He will bestow it!! 2012 was one of the best and happiest years of my life, and I think one reason was that I sang every day, often to or with someone else. It involves all our parts — physical, mental, emotional. I think this has been my favorite post in the blogosphere this year regarding gratitude! Music has always been such a huge part of my life and you’re right even when sadness is pressing down music can warm our souls. I’ve forgotten that beautiful truth. The unexpected gift I am grateful for is the fishing trip I won in a drawing sponsored by my local YMCA. I entered the drawing at a conference for cancer survivors. Yep, that’s me – 3 times now. Four of us were gifted with this fishing trip offered by a fishing guide whose mother had cancer. I was dumbfounded when I got the email saying my name had been drawn. This was rapidly followed by elation, fear, insecurity, a need to control and, finally, surrender. I was the last one to catch a fish (a king salmon) that day.. I think that was God’s reminder to be humbly grateful. I loved the reminder of your unexpected blessing at Mayo Clinic, Jennifer. I’m so sorry your dad is still struggling. Also your daughter. And all of you as a result. So they never did find out what’s wrong with your daughter yet? Praying for God’s strength for you all! Have a blessed Thanksgiving! May God send unexpected blessings! Hugs! My unexpected blessing is that I found a new home through a co-worker, for a stray puppy found in my school bus route. I am grateful for people who love animals. Oh what a blessing to be gifted with that song in such a hard and trying place! I’m so thankful that you passed on the encouragement to all of us. Which leads to my unexpected blessing: I have been amazed at the encouragement and support that I’ve felt through this Digital Community of Believers! I’m so thankful for the ways that God joins us all together to praise Him, and pray for each other. Your Dad and your family remain in my prayers! –Blessings to you! Great video- I love those unexpected blessings and it’s so true that “The days when I don’t feel like singing at all, are the days when I need to sing most of all.” When we praise God, even in difficult circumstances it can have a great impact. I’m reminded of the story of Paul and Silas singing in prison. But it can also make a huge difference to our heart and our attitude. My unexpected blessing was an answer to prayer yesterday where a situation I expected to be difficult went far, far better than I would ever have hoped. What a wonderful challenge for the season! Thank you for sharing! This is so so great. All we want is sometimes just a sandwich,…but God wants to give us so much more. Sometimes we don’t know what we really need, how that thing He is holding out to us will benefit us, but He gently guides us to that gift He is holding and He opens His hands freely to us. Thanks for sharing this, Jennifer and prayers continued for your sweet, family. ‘Love your expanded definition of gratitude that explain it’s “more than a nice gesture acknowledging the gifts in our lives. It is the stubborn refusal to be held hostage by fear and despair. 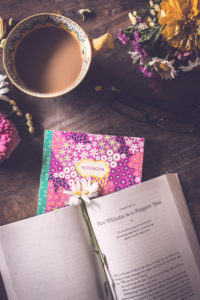 It’s saying to the world — and to ourselves — that despite everything, this old world is still a beautiful place.” Your 30 prompts provide a wonderful way to find the beauty. Thank you, Jennifer. So grateful for YOU–your wisdom and insights always feed my spirit! So many unexpected blessings lately. But one is walking with my husband while our son practices basketball. I originally thought I would get “important” things during those 90 minutes, but then my husband started driving over after work so we could talk and walk during this time. Sure i am not getting so much done, but spending time together is precious time and in the end we are doing more important things than what I thought I would be doing. “The days when I don’t feel like singing at all, are the days when I need to sing most of all.” And all God’s people said: Amen! 🙂 Love that the Lord was there to remind you of His faithfulness and His love for you just when you needed it. He does that with all of us, we just need to be watchful. Great post fellow #hopewriter! Happy Thanksgiving! I remember when you first posted that video… I had so many little things going on that day and yet was revelling in a massive “gripe-fest” and then your post went up, and it forced me to shift my attitude instantly. Late late late to the party, but so thankful for the celebration with my family that ran off the tracks of normal this year, but was still a time of blessing! One thing I’m learning to be thankful for is the truth that change is always on the menu at holiday celebrations as our kids grow up and their lives become full.